A maverick group of astronomers is proposing to radically reshape one of NASA’s most successful missions in the modern era, the New Horizons probe that flew by Pluto in 2015 and is now continuing its voyage into the depths of the outer solar system. The group’s paper describing their proposal, submitted to the Publications of the Astronomical Society of the Pacific and available as a preprint, suggests that before its fuel is spent and some of the systems are shut down to conserve power, New Horizons should be repurposed as a space telescope that can take advantage of the near-lightless conditions in the outer solar system to study stars, galaxies and more. The plan calls for utilizing the Pluto probe’s eight-inch telescope, called the Long Range Reconnaissance Imager (LORRI), to peer at distant, dim objects beyond the solar system’s boundaries. LORRI, the group says, could be used to support NASA’s upcoming Transiting Exoplanet Survey Satellite (TESS), a planet-hunting space telescope launching in April. Co-author Diana Dragomir, an MIT planetary scientist who works on TESS, says this mission will need all the backup help it can get. That is because it is set to find tens of thousands of candidate planets—many of which will require time-consuming independent confirmation using other telescopes. Beyond boosting exoplanet research, New Horizons could also use its ultraviolet and infrared sensors to study the early universe. Whereas the cosmic microwave background, an information-packed afterglow of the big bang, is perhaps the most well known, there are also ultraviolet and infrared backgrounds that come from stars and active galaxies lighting up cosmic dust in a faint, universe-spanning glow. This could provide insights into how the early universe came together. “The further you get out of the solar system, the more you can do these kind of observations,” says Michele Bannister, a planetary scientist at Queen's University Belfast who was not involved in the study. She points out one NASA spacecraft—Deep Impact, which studied Comet Tempel 1 in 2005—was later retooled into a new mission dubbed “EPOXI” in order to assist with exoplanet hunts. So how realistic is the group’s proposal? “It’s really an issue of logistics and timing, and making sure the resources are available and we’re doing nothing to put the mission at risk,” Zemcov says. Convincing others there’s no risk involved may be a tall order, however. 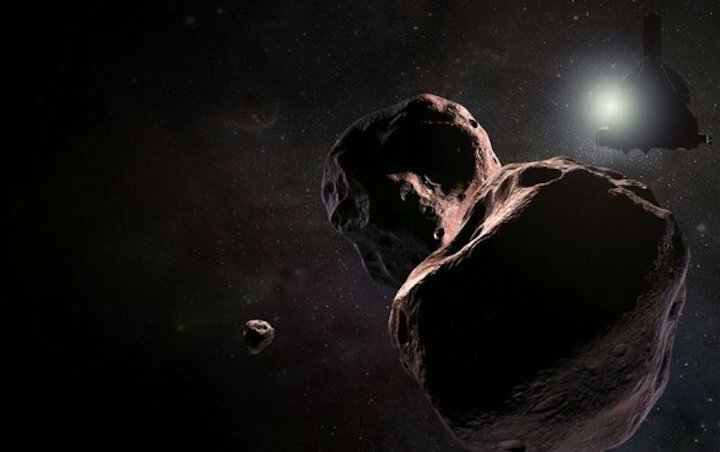 New Horizon’s extended mission after Pluto involves flying by an ancient remnant from the solar system’s birth, a chunk of rock and ice known as 2014 MU69. After that encounter, the craft will transmit its data to Earth—which, due to the immense distances, will take about two years to completely trickle back home. After MU69 the craft will be low on propellant—less than a quarter of a tank. That could be enough to pursue a third flyby target during a second mission extension, as many senior New Horizons team members would prefer. But that encounter—plus keeping the spacecraft pointed at Earth for the subsequent data transmission—would probably use most if not all of the remaining fuel. Those preexisting plans—plus the fundamental impracticalities of efficiently controlling and getting data from a telescope at the edge of the solar system—could crowd out Zemcov and company’s proposal. “These types of proposals are generated by the dozens, if not hundreds, so it’s not uncommon to see them come up and then go nowhere,” says Jason Callahan, a space policy advisor at The Planetary Society. Another factor is funding. NASA’s spending is highly compartmentalized to protect its top-priority programs from cannibalizing one another—money for astrophysics, for example, is considered separately from funding for planetary science. But the system is flexible—some would say vulnerable—because Congress ultimately defines the details of the space agency’s budget. To have any realistic chance of moving forward, the proposal to use New Horizons as an astrophysics platform must pass muster with the mission’s principal investigator, Alan Stern, a planetary scientist at the Southwest Research Institute in Boulder, Colo. Callahan, for one, is doubtful that can happen, even though the proposal has tacitly received modest support from some members of the New Horizons team. “Alan Stern is never going to be done with New Horizons until the day he dies—so if he’s not down with it, it won’t happen,” Callahan says. Stern drafted his first proposals for a Pluto mission in the 1980s, and faced repeated setbacks before New Horizons finally launched in 2005—making this, in many ways, his life’s work. Stern, for his part, has already stated in a tweet there is simply “no fuel, no money” for such a radical repurposing of his cherished mission. In the end, the push to make New Horizons the first truly far-out space telescope, like many extended mission concepts, may never see the light of day—or the pitch-black cosmic vista of the outer solar system. “This idea has been around in the community for years and years but the problem is opportunity,” Zemcov says. For now, as New Horizons continues its journey beyond Pluto, that opportunity is slipping further out of reach.